Oct. 2, 2018 (Lincolnshire, Ill.) – Klein Tools (www.kleintools.com), for professionals since 1857, introduces USB Meters and Tester (Cat. Nos. ET900, ET910 and ET920), enabling professionals to monitor the power delivered by USB ports. The ET900 easily measures USB-A power delivery devices and features a compact, lightweight design. 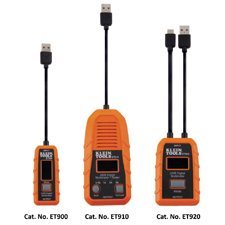 The ET910 tests and measures USB-A ports, which builds on the ET900 with the additional ability to test the port’s maximum current output. Lastly, the ET920 measures both USB-A and USB-C connectors for added flexibility. This unique product line offers new capabilities with intuitive, easy-to-use technology, built into a pocket-sized design for easy portability. For more information, visit www.kleintools.com/new-products or search for #NewKleins on social media. Since 1857 Klein Tools, a family-owned and operated company, has been designing, developing and manufacturing premium-quality, professional-grade hand tools. The majority of Klein tools are manufactured in plants throughout the United States and are the No. 1 choice among professional electricians and other tradespeople. For more information, visit www.kleintools.com. Klein is a registered trademark of Klein Tools, Inc.